My husband jokes that I have a black thumb, because every time I try to grow an herb, it dies. I plant flower seeds and they don’t grow, or they grow but the gardeners for our rental house mow over them. Despite my failures with gardening, I’m not giving up. There’s something about taking part in sowing and hoping for growth that I cannot resist. Maybe it’s a part of the divine “spark” in me that yearns to create and bring forth something new and beautiful. Only, I can’t actually make plants grow. That’s entirely dependent upon God, who is the Master of the weather and seasons and bugs and life. The spiritual life is similar: no matter how much I long to sow the seeds of faith and be responsible for the growth of that faith in my family, it’s not up to me. I’m not the grower. I’m the sower. I find I’m quite a bit like the sower in today’s parable. Imagine this person, tossing seeds about wherever he walks. He doesn’t plant only in carefully tilled and prepared patches of soil, meticulously space each seed, or water with precision. No, the sower in Luke’s Gospel scatters seeds everywhere. On the path, on the rocks, among the thorns. (Luke 8:5-8) I’m a bit haphazard with my literal planting, just as I’m a bit haphazard (though with my best intentions!) at sharing my faith with my family. One day we attend daily Mass and celebrate a Saint; the next feels like a struggle to gather my family for bedtime prayers. I pull out rich stories of the Saints and colorful books about Jesus’ life, and forget to actually read them with my children. On the flip side, when driving past a car accident or when hearing news that a friend has an urgent prayer request, we stop to pray right away for those in need. And lately, some of the better curious, faith-seeking questions and conversations have happened in the kitchen while we prepare dinner. I sow imperfectly, as did the sower in today’s Gospel. Yet I keep sowing. I won’t give up simply because my efforts frequently fall short. I won’t give up when I don’t see the fruits of my efforts. 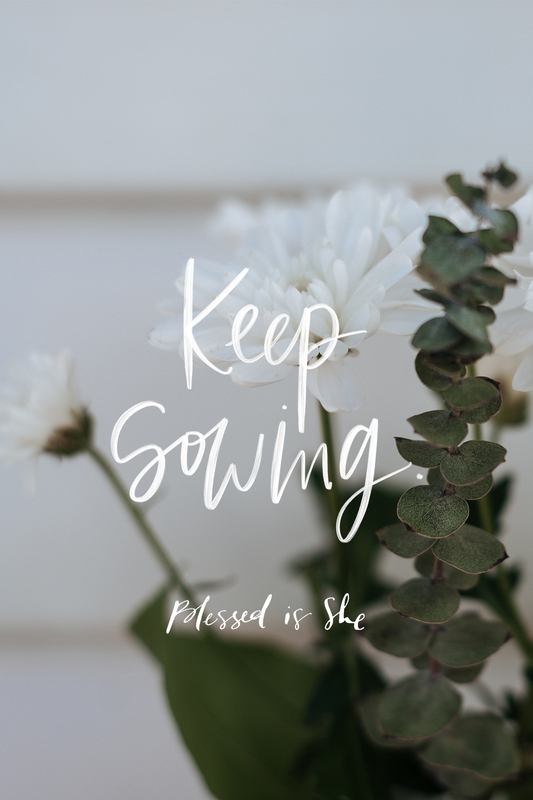 As a priest once said in his homily, “We do the planting, and God does the growing.” I will persevere and trust that God’s grace will make up for my shortcomings, and His timing will be right for abundant growth. We are the sowers; God is the grower. Take that to heart today. Good reminder we are not in charge.